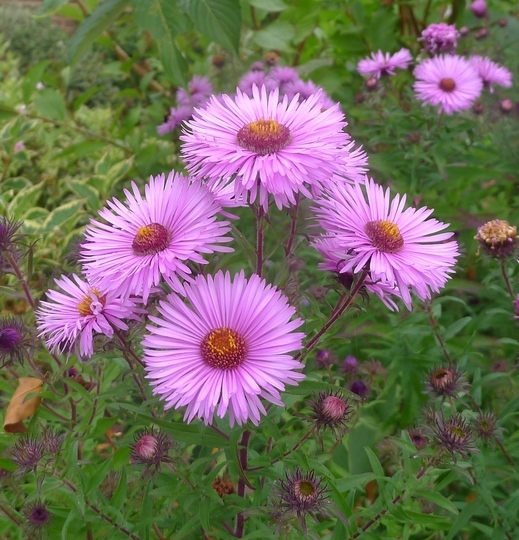 Just as many plants are winding down for winter, asters brighten up the garden. 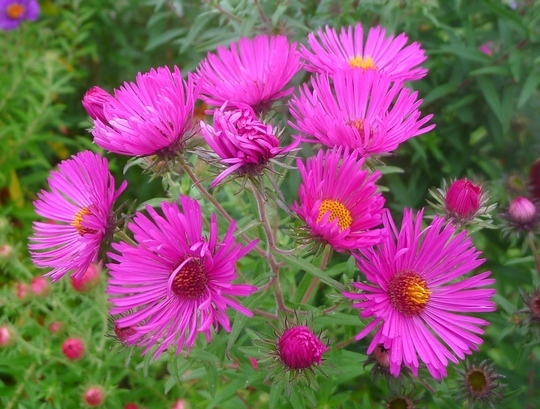 While many of the newer varieties are short, there are others four to five feet tall, and more suitable for a position at the back of the border. These are mainly novae-angliae varieties which have occurred naturally from a species that hails from Canada and parts of the United States. 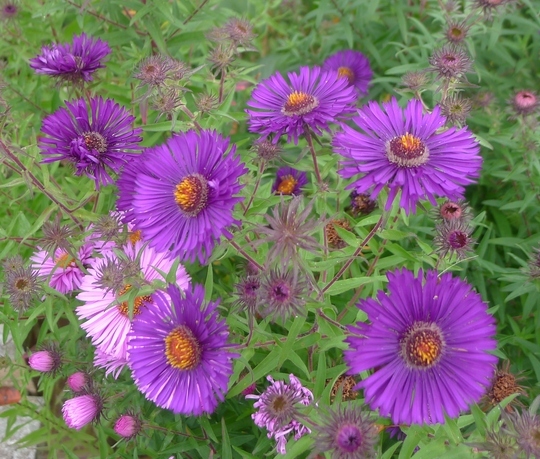 They like an open, sunny position (the flowers will not open fully in shade), with a soil that is not too dry. Although mildew resistant, the lower leaves may be affected if the plants are under stress through lack of water. These also tend to die off as the plants come into flower, but this effect can be reduced by pinching out the young growth in spring when it is about six inches high. 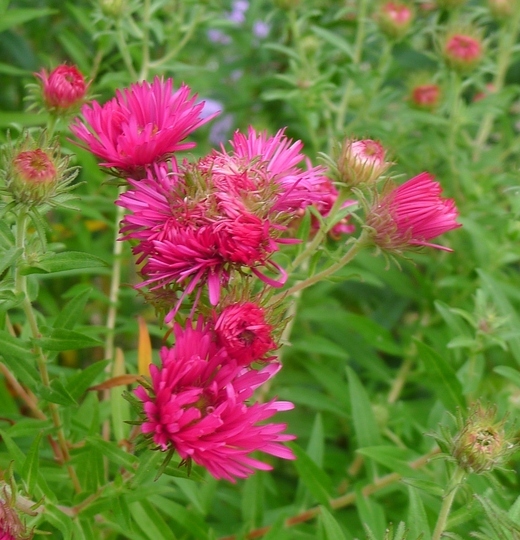 The flowers close in the evening, making them less suitable as cut flowers, and they do not adapt well to growing in containers, but in the garden are able to perform at their best. Looking at them in closer detail. 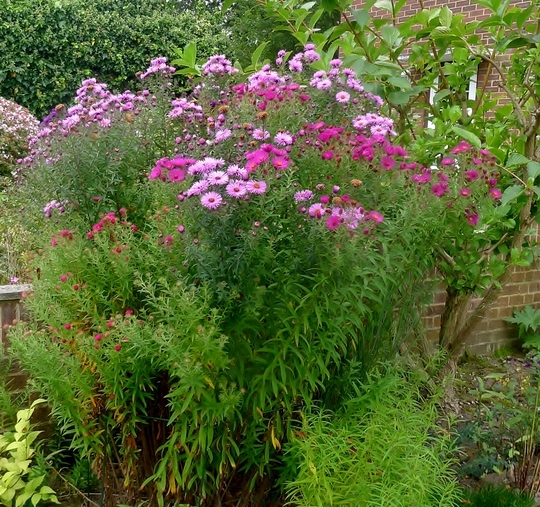 Now I’m after a white-flowered variety to complete the autumn picture in this part of my garden. They are lovely Andrew - i remember them from last year too. Fabulous colours. Mine are nowhere near out yet. Love them..and have a field full of them. (all wild) The weedier Ciliolate Asters (white) have taken over parts of my lot. They like the sogginess down near the stream and each autumn they are a mass of buzzing white. The bees just love them. Just visited the national collection at Picton nurseries...wonderful selection. DD - yes, I saw your photo. It is now one of my favourites.